I really wanted to get this recipe posted before Christmas, but since New Years is just around the corner, I guess all is not lost. Speaking of Christmas, how was everyones Christmas? What did you get? K, so not to brag, but I had the best Christmas!! I got the Cuisinart Ice Cream maker I have wanted forever. And I got a new cookbook. Always a great gift!! And I got this little guy! He is such a sweet heart!! I’m gonna name him Tater, like as in tater tots. I know what your thinking. “Your even gonna name your dog after food?” No, I’m not naming him after food, it’s more of a coincidence. I swear!! No I’m not in denial, ahem. Anyways!! Isn’t he cute! Potty training is gonna be a huge job, but that’s ok.
We also went up north, where it was both cold and snowy!! Loved the snow, not so much the cold, but we had so much fun sledding and playing in the snow. Here’s my baby all bundled up. We kept laughing that he looked like the little brother off of “A Christmas Story”. The one that says, “I can’t put my arms down.” I wanted to get a picture like that with his arms sticking straight out, but he wouldn’t cooperate. What do I expect from my little tank. Gotta love him. 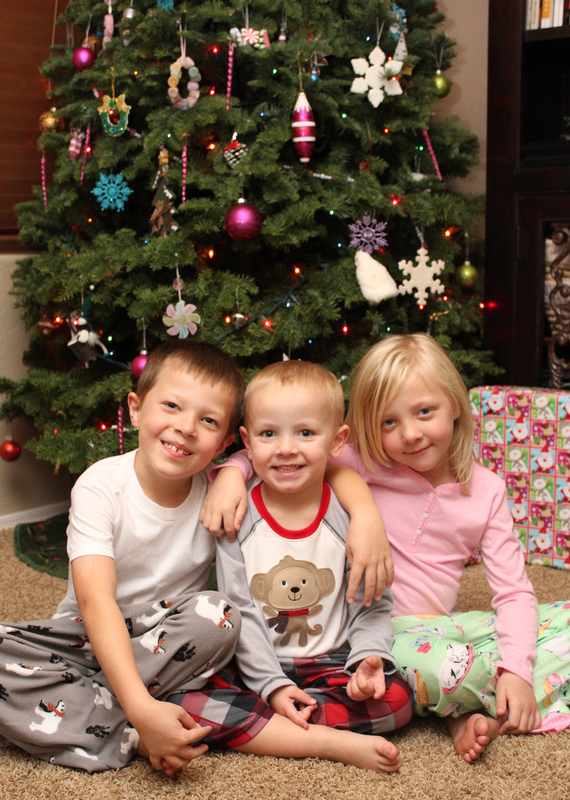 Then, last but not least, here were my kiddo’s in their Christmas pajamas on Christmas Eve. So yeah, it was a good Christmas 🙂 Hope you guys all had an awesome holiday too!! Oh, and this recipe. Can’t forget this recipe!! This is awesome! It’s one of the recipes my mom has kept and made over the years and it is to die for. 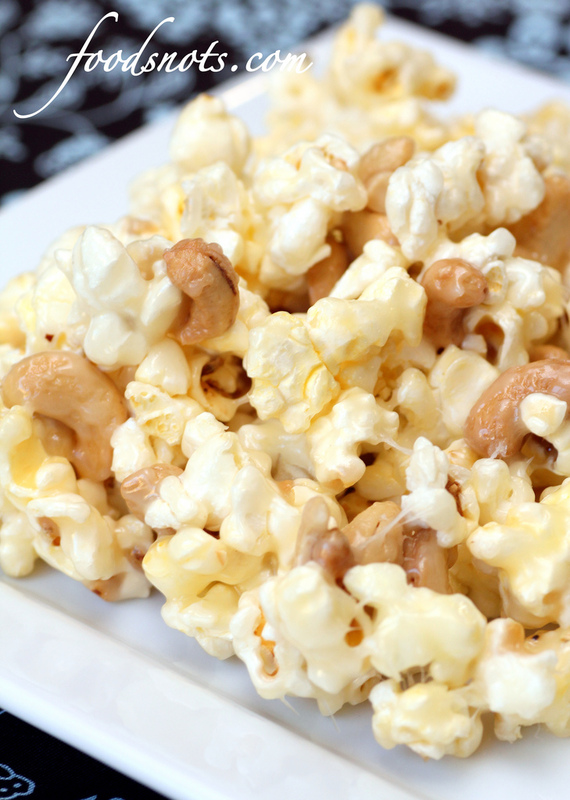 It’s not quite like a caramel corn, but it kind of is. It’s hard to describe the taste, but it’s amazing. And it doesn’t matter what kind of nuts you use. I recommend either pecans, walnuts, peanuts, or if you are feeling especially experimental you can do cashews. You’re gonna want to add about 1 to 1 1/2 cups, depending on your taste. I like cashews cause they are really soft and they just taste so dang good. But choose your favorite!! Enjoy! In a medium saucepan combine sugar, syrup, and butter. Bring to a boil, and boil for 3 minutes. Remove from heat and add 1 teaspoon vanilla extract. Slowly pour over popped popcorn and nuts (if desired). Quickly stir hot syrup mixture into popcorn until evenly covered. Cool and serve.